This book consists of several scholarly explanations of the classical work on Tawheed and Shirk. 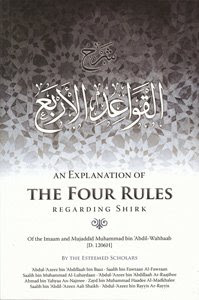 “The Four Rules”, which was written by the Imaam and Mujaddid of the 13th century, Muhammad bin ‘Abdil-Wahhaab, may Allaah have mercy on him. It is called “The Four Rules” because it consists of four fundamental basics which one can use to distinguish a believer from a disbeliever and a polytheist from a monotheist. This treatise is considered one of the Imaam’s more significant works. Even though it may be more concise than some of his other works, it is just as comprehensive in terms of the information covered and points of benefit discussed. In an effort to bring the most benefit to the English reader, translations of eight separate explanations of this monumental work have been included in this present publication. It is hoped that the inclusion of all these explanations will provide readers with a comprehensive understanding of this book and the subjects it covers.